Hi there! Today I’m sharing a review for a contemporary M/M YA romance form Becky Albertalli. SIMON VS. 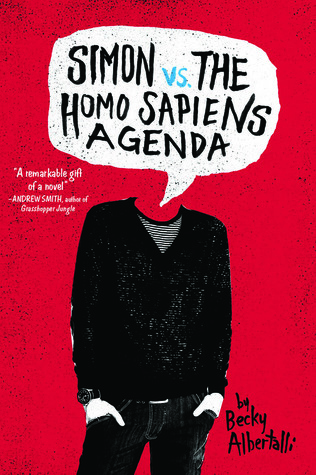 THE HOMO SAPIENS AGENDA is a book that has met with critical acclaim, and for good reason. It’s fantastic. As a YA romance it’s not steamy, but it’s got so much heart, and a beautifully told coming-out story. Today is this is the First Book-iversary, as it was originally published 4/7/15, so I thought I’d give it a shout out. I just adored this YA contemporary coming out M/M romance. Simon is a 17 y/o junior growing up in a suburb of Atlanta. His school is mixed and he has friends of color, notably Abby his close friend. His longtime friends Leah and Nick are kind and fun, but a bit more sedate than Abby who is a cheerleader and the object of admiration of many males–firstly, Nick, who is simultaneously the crush of Leah. Makes for an awkward dynamic for Simon. Secondly, Martin Addison, a goofy, lanky boy in the drama club who is infatuated with Abby enough that he blackmails Simon to ingratiate himself into their “group”. See, Simon is a closeted gay teen, and he has an anonymous email pen pal–another gay teen (calling himself Blue) at his high school. They have been in contact for the past few months, using pseudonyms and decoy email addresses in order to safely explore their places in the world. The emails serve as a sounding board/confessional/journal for the boys and Martin intercepted these communications one day when Simon neglected to completely log out of the library computer. Martin’s an (almost) decent kid who makes some seriously d-bag decisions, and Simon has to decide if he wants to go along with Martin’s plans, or come out. And this is something he can’t reveal to Blue because he’s afraid that Blue will stop communicating with him to protect his own secrets. It’s a beautifully written teen romance with no steam and some real fun. There is limited angst, and when it does exist it’s not all about the gay thing. Simon’s nervous about the status of his friendships in general. Leah’s frustrated about Nick liking Abby, and Simon always feels in the middle of that. Plus, Leah’s disappearing more and more from their hang out time, and Nick’s not helping by being ignorant to Leah’s feelings. On the homefront, Simon’s got a rather supportive set of parents, even if his dad makes some off-color jokes regarding gays. Words he’s later sorry for. I loved the family dynamic, and how close-knit it is. Simon makes a “choice” (under duress pretty much) to come out and that causes a bit of a ruffle, but not in the expected way. I don’t want to give away too much of the plot, but I believe even if I gave a verbatim account of the book it’s STILL a worthwhile read. Simon’s character is a fantastic sketch of today’s youth. He’s not quite sure why he has to come out as “gay” when all those around him don’t have to reveal, or explain, their straightness. And, that’s an interesting idea. When Simon becomes a “topic” at the high school his friends aren’t just in his corner, they are ready to do battle. Even people who aren’t his particular friends are willing to step forward on his behalf. It’s a heartening scene, especially as it’s set in the Deep South. that said, expect some instances of homophobia. Also, I nearly wet myself when they all went to the “gay”-borhood in Atlanta and Simon was a bit too adventurous. So sweet and cute and endearing. In all, Simon’s dearest wish is to meet Blue. After five months of sharing his most secret and personal self online he just wants to meet the boy he considers his boyfriend. Blue’s so resistant, and when Blue discovers Simon’s identity and still won’t meet? It’s more than a little crushing. Don’t fear though. The books sings with an HEA. It’s just the right amount of tenderness, and there’s no doubt that Blue is just as smitten with Simon. This is a book that I’d recommend to all readers of contemporary YA. It’s completely innocent sexually, and has only a tiny bit of alcohol use. There is strong language at times, including f-bombs, which were not a trouble for me, especially as I was reading a 17 y/o boy’s perspective. I loved the diversity here. There are a few prominent black characters, and a couple who are Jewish, and others who have no religion and some who are religious and some who are gay, straight or bisexual. The mix was refreshing and fun and awkward and whole. I loved the meddling and the machinations, and the high school antics and hi jinks and the blessed union of Simon and Blue and an end that I never wanted to reach. I’d read about Simon and his life for volumes, probably. Interested? You can find SIMON Vs. THE HOMO SAPIENS AGENDA on Goodreads, Amazon, Barnes & Noble, iTunes and goodness knows how many other discount outlets and your local library. You can find out all about Becky Albertalli on her website, which is really, really something. She’s also on twitter and There are some notes in the webspace that she’s working on a loosely-connected sequel-of-sorts to SIMON, and people are clamoring for it. Me among them. Thanks for the review! I really loved this one too. I hope Becky Albertalli does write that sequel.